at me when I came home to you afternoons in Washington and of how you used to look into my eyes and somewhere far beyond when you sat across from me at the table. I notice how brown and chubby you look. Maybe the camera made you out better than you were, but the picture shows you looking charmingly healthy. It's good to see in the pitchers that you're not wasting away on your Red Cross shows and your writing to a very distant husband. 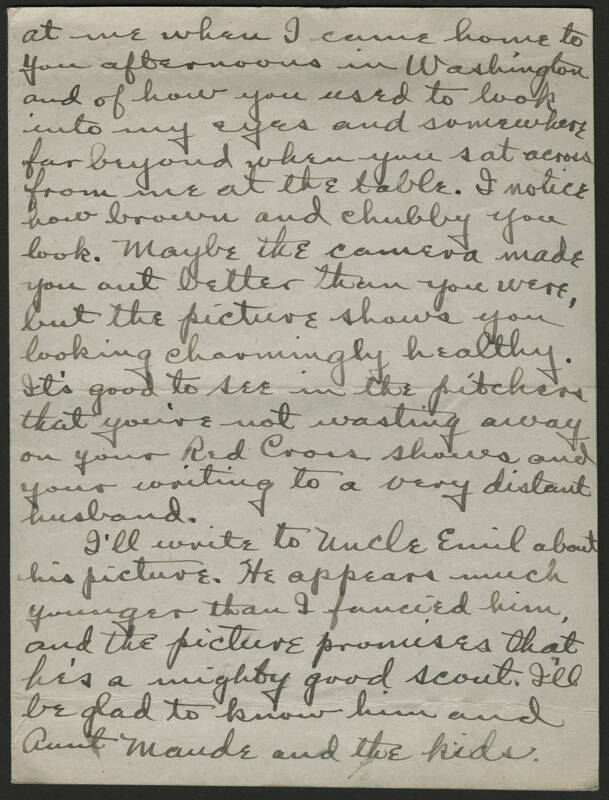 I'll write to Uncle Emil about his picture. He appears much younger than I fancied him, and the picture promises that he's a mighty good scout. I'll be glad to know him and Aunt Maude and the kids.